The Stochastic Momentum Index Strategy is an automated version of the SMI indicator. The SMI indicator computes two lines, the SMI data line and the SMI indicator line. This strategy waits for those two lines to cross and then places a new trade. The Stochastic Momentum Index Strategy is designed to look for, and perform best, in market conditions where prices are either overbought or oversold. This strategy was developed on FXCodebase. The Stochastic Momentum Index Strategy places trades when the SMI data and signal lines interact. If the SMI data line crosses from below to above the SMI signal line, the strategy will open a sell trade. If the SMI data line crosses from above to below the SMI signal line, the strategy will open a buy trade. As an oscillator, this strategy will always have a trade in the market unless stops and/or limits are used. 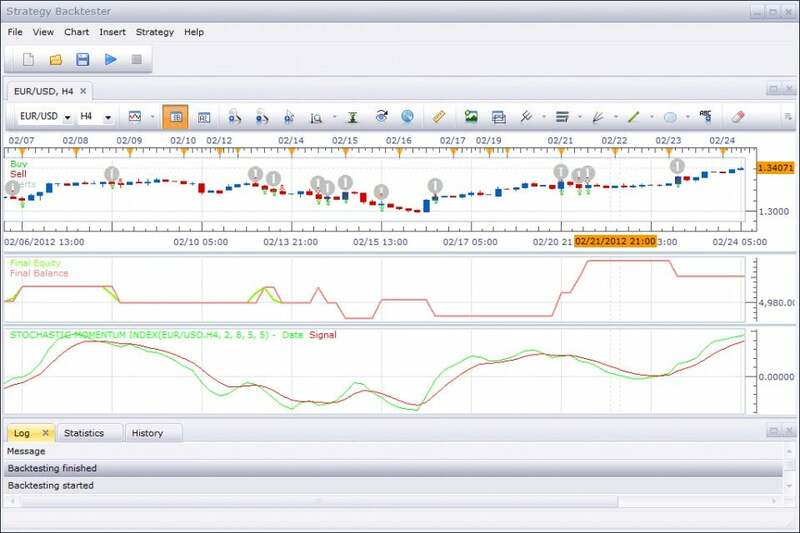 This Automated Strategy is only compatible with FXCM Trading Station Desktop software. In order to purchase or download the app, an FXCM live account is required. Once downloaded, the app can be used on both live and demo FXCM accounts. There is no guarantee that the systems, trading techniques, trading methods, and indicators will result in profits or will not result in losses.